Head for the depths of the Minecraft sea to discover the Ocean Monument. Battle the elder guardian with spring-loaded shooter, activate the dry sponge function to enter the monument and locate the lever to open the treasure chamber full of golden blocks. 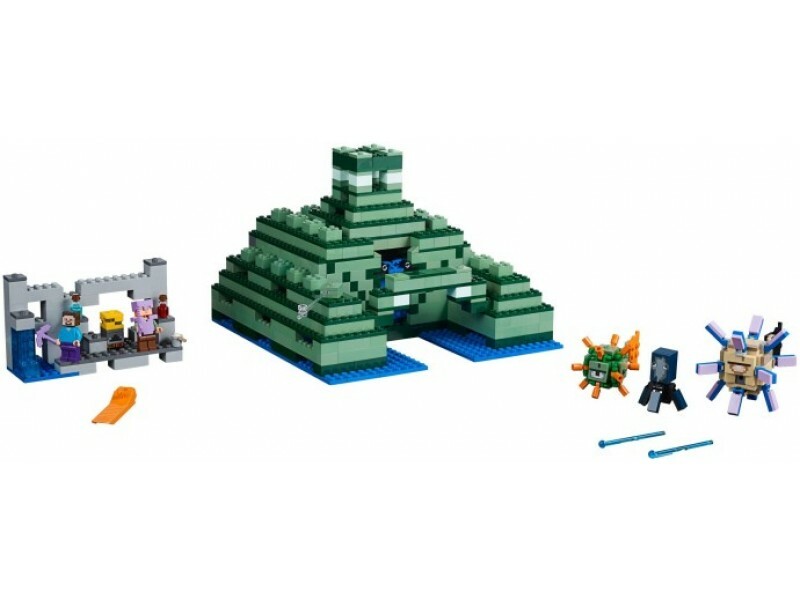 Enjoy hands-on Minecraft adventures featuring your favourite characters and objects with this easy-to-reconfigure LEGO Minecraft set—designed for young fans of the highly successful sandbox video game. Includes Steve and Alex minifigures, plus squid, guardian and elder guardian figures. Features a Minecraft ocean monument with a water sponge access function and opening treasure chamber, plus a cave with a furnace. Put on your enchanted armour, grab your enchanted sword and prepare for action! Accessory elements include enchanted armour, golden blocks, wet and dry sponges, bucket of milk and a Potion of Water Breathing and a Potion of Healing. Set your imagination free—rebuild the set for more LEGO Minecraft creations! Measures over 15cm high, 24cm wide and 24cm deep.